Good help is hard to find, and experienced contractors know the best tradespeople are handmade on the job. Raw talent must be spotted, trained and taught the basics. Woodworkers learn by doing, and doing it some more, adding time saving techniques when they see them, and turning safety protocols into good habits through repetition. There are twelve years separating the two young men in the photo below. The white shirt and ball-capped boy is at the start of a life long quest for skills. He works with his father on construction jobs in the summer to gain experience that will advance his education and career as an architect. The red shirted employee we know from previous blog posts, is Matt. He’s an apprentice carpenter on the long path to becoming a finish carpenter, and custom cabinetmaker. Generally, a carpentry apprenticeship takes a total of 7, 200 hours (four years) to complete, and consists of on-the-job training and in-class instruction. The in-school portion typically takes one tenth of that time, or about 720 hours to complete, while the on-site component comprises the rest of the training. Anyone skilled in math might have already deduced that Matt has to spend 6,480 hours on the job in tasks directly supervised by an experienced journeyperson to get his ticket. Today, Matt is an apprentice carpenter. He’s experienced, yet still learning and polishing his skills as a finish carpenter, and among these many disciplines are his cabinetry skills. Matt has five years on site experience with a diploma in construction renovation technology from George Brown. He’s mastered the basics, and is now working out points for style. See below how this craftsman glues his joints. Unseen are short strips of green painters’ tape which are hanging nearby that he will use to mitigate glue mess that oozes from between joints once he gets the piece in place on the wall. When the glue squirts up from the joint, it will dribble onto the tape and not the wood. 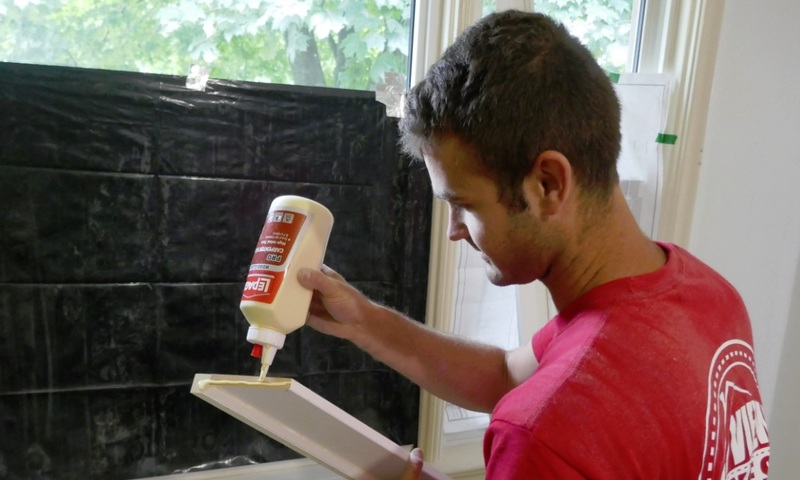 When the glue dries a little, Matt will remove the tape to reveal a clean joint. The word ‘joiner’ is derived from jointer, which was the ancient Briton’s word for a carpenter before iron nails revolutionized the building trade. Can you imagine building anything without nails? The science of woodworking in those days was all about the joint, and whether you made square joints or dovetail joints etc. Today Matt wouldn’t be mislabeled if you called him a joiner, which became the English word for anyone who assembles and joins wooden components. The person who joins pieces of wood together to build a wooden thing (box, cart, door, stairs, etc) was a joiner, and the title was traditionally applied to craftspeople who used only wood. Modern building tradespeople are much more specialized. We call workers who frame houses framers, and they cooperate with roofers and glaziers who install windows and sliding glass doors. Inside the house, the trim, shelving, handrails, bathroom vanities and kitchen counters are assembled and installed by finish carpenters. Kitchen remodeling cannot be done without a finish carpenter’s equipment and skills. These professionals work with a variety of materials, including wood, laminate, and steel. They can be found on both residential and commercial job sites building stairs and installing cabinetry and storage sections. In some situations, carpenters are also designers; in others, they are simply required to be able to read and follow blueprints and implement the architect’s vision. The crew watched as Keith Travers the building manager leveled the chop saw simply by pushing the rig a few feet farther along the floor to where he’d marked a flat spot, and Matt nodded with silent understanding. This saves them from constantly readjusting the saw every time they move to another room. Keith had clearly been here already, and he’d run a level across the floor to find and mark the sweet spot in advance. Some pre-apprenticeship programs help students secure on-the-job training with local employers, and in a round-about way this is how Matt came to work with Eastview Homes so many years ago. We are listed as reputable building partners with a great many Ontario based associations and organizations (such as the CLAC Union and Merit Ontario) which help graduates connect directly with potential employers, and access exclusive job boards and search tools. Matt did that away back when, and here he is now. The Ontario College of Trades (OCOT) was formed in 2009 to oversee the skilled trades in Ontario. Its mission is to “protect the public by regulating and promoting the skilled trades.” The Ontario College of Trades enforces training and professional standards across the province. This is the government body that investigates complaints made against members, and can levy charges, tickets, and other penalties if public-reported offenses are proven legitimate. It is important to note that in order to complete a general carpenter apprenticeship, students must be registered with (become a member of) the Ontario College of Trades, and they must remain an active member of the OCOT throughout their apprenticeship. OCOT regulates trades by deciding which are “compulsory” and require certification that can be checked and validated on job sites, and which are “voluntary” (and as such need no certification). There are currently 23 compulsory trades in Ontario, including General Carpenter. General carpenters must register with the OCOT as an apprentice, journeyperson candidate, tradesperson, or journeyperson. The annual registration fee for members varies according to “membership class”. Carpentry is a skilled trade in which the primary work performed is the ‘cutting, shaping and installation of building materials during the construction of buildings, ships, timber bridges, concrete formwork’. That is a union description for carpentry. The ever-changing art and science of joining wood together is what we do best at Eastview Homes, and we consider ourselves to be finish carpenters. 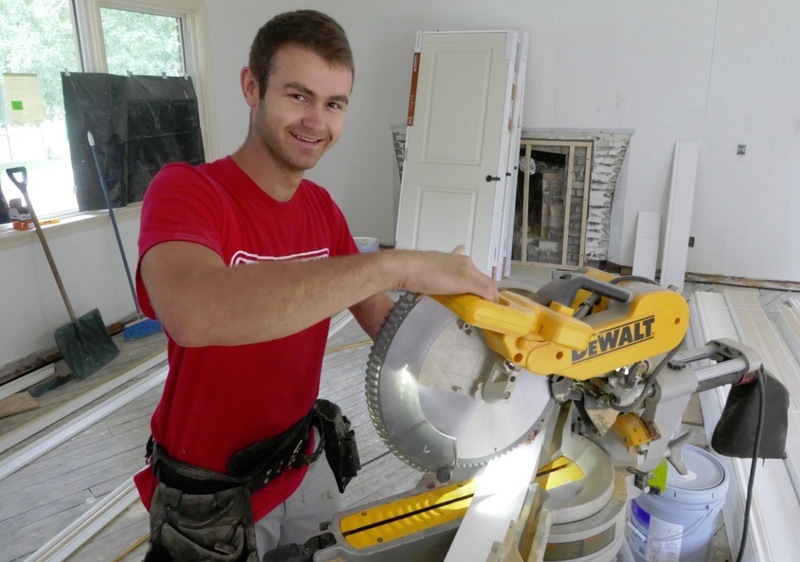 When Matt is done his apprenticeship, he will have the same qualifications, albeit less experience, as the three other finish carpenters on the Eastview Homes team. In many ways, this modern apprenticeship system is still very medieval. It’s been around since the high middle ages, and it continues to exist only because it works. A skilled finish carpenter can build cabinets across any wall in a kitchen or bathroom with or without the aid of blueprints and parts calculations. The mark of an experienced professional is how well they can add it all up in advance, and how close they come in reality. Look at their work and especially their cuts; are there tear-outs on finishes? Are the angles straight? Is everything sanded, sturdy and level? Another sign that your trades person is an expert is how well they conserve their equipment and building supplies. And of course, at the end of the job it’s the quality of their finished work that really matters.